Posted on June 6, 2017 at 7:26 pm. Columbia Distributing is proud to provide Townshend’s Brew Dr. Kombucha. 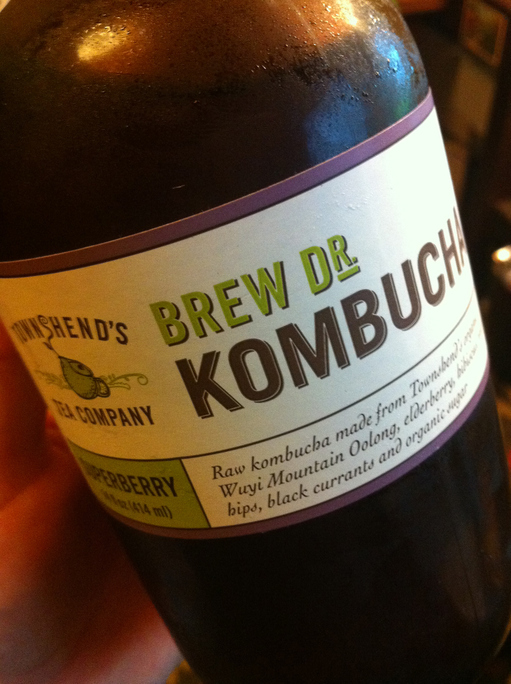 Earthy and tart with a slightly sour aroma, kombucha, or mushroom tea, is a health beverage that packs a serious punch. Made with black or green tea, sugar, bacteria and yeast, this fermented beverage brews over the course of approximately 7 to 14 days and contains nourishing probiotics. Whether you have extra kombucha on hand that you need to use up or you’ve let a batch ferment for too long, you’ll be able to put the surplus tea to good use with these four creative elixirs. With a sour tang that closely resembles the taste of apple cider vinegar – especially if it’s brewed for an extended period of time – kombucha makes a great replacement for vinegar in salad dressings, condiments and marinades. Swap out the white vinegar in an Italian dressing recipe or in condiments, such as ketchup or barbecue sauce. Due to its acidity, you can also use kombucha to create marinades for seafood, poultry and other types of meat. From granitas to popsicles to smoothies, give your kombucha a second life with delicious and nutritious frozen treats. Simply blend kombucha with fresh fruits or juices and then freeze the mixture in molds or ice cube trays to produce refreshing popsicles. Alternatively, you can toss a teaspoon of kombucha into your favorite smoothie recipe for a simple immunity booster. Is it time for spring cleaning? Step your routine up a notch with a simple do-it-yourself household cleaner made with kombucha. Take one part water, one part kombucha and a few drops of essential oil, such as lavender, lemon or tea tree, and shake all the ingredients together in a spray bottle. And voilà – now you have an all-natural cleaner that can be used around the house. Did you know kombucha can be used in both cocktails and mocktails? Exchange sweet and sour mix or club soda with kombucha in virtually any cocktail recipe for a healthy twist on your favorite mixed drinks. You can even ferment the kombucha for a second time with juice for a sweeter, more carbonated concoction. From Townshend’s Brew Dr. Kombucha to soda to beer and more, Columbia Distributing supplies a diverse range of alcoholic and non-alcoholic beverages to suit your personal taste. Contact us today to learn more about the brands we distribute.